Your outdoor gourmet kitchen awaits with the addition of the Napoleon Built-in LEX 605 Grill Head. This grill head will allow you to entertain well after dark with the stylish backlit control knobs. Napoleons JETFIRE ignition system makes sure that your grill lights every time by shooting a jet of flame to light the burners. Sear quickly over the integrated infrared bottom burner. Cook all of your favourite foods on a grill that fits perfectly in to your ideal outdoor kitchen. Add an extra 10,000 BTUs to your outdoor kitchen while saving room on your main grill. This drop in is a single side burner with a flush top design. Wreathed in durable stainless steel, it has a cover to keep the elements out as well. The Drop In Range Side Burner works just like our quality grills, with an electronic ignition that will light up every time. Whether you use natural gas, or prefer propane, this Drop In Range Side Burner is the perfect addition to your custom outdoor kitchen. Become the monarch of your next barbecue, picnic, or tailgate with Napoleons TravelQ PRO. Grill up to 20 hamburgers at once on the 285 square inches of cooking area. Easy carry handles let you take this grill wherever you want. Place it on any stable, flat surface and turn on with the easy to light JETFIRE ignition system. Napoleon prides itself on taking your grilling experience to the next level and the Rogue Series R425SIB Gas Grill is the perfect way to make your (sear) mark while cooking. This mid-sized grill can feed a group as you work culinary magic on 425 square inches of main grilling surface. You can show off all of your savoury skills when you grill different. 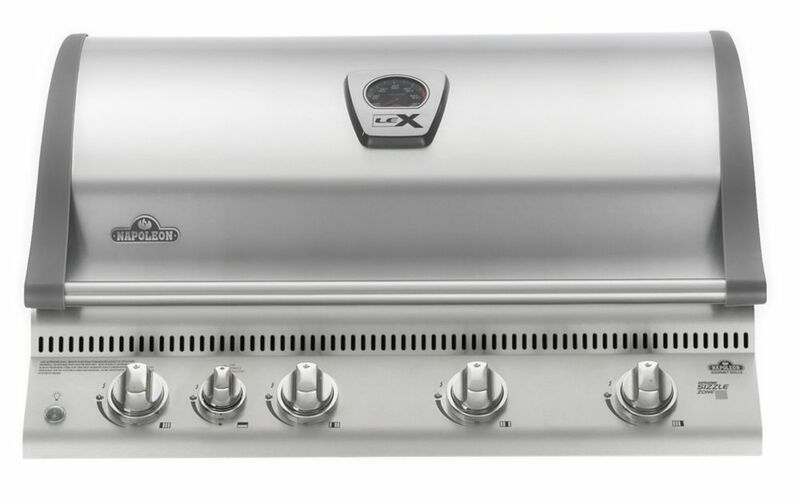 LEX605 Built-In Propane BBQ with Infrared Bottom & Rear-Burners Your outdoor gourmet kitchen awaits with the addition of the Napoleon Built-in LEX 605 Grill Head. This grill head will allow you to entertain well after dark with the stylish backlit control knobs. Napoleons JETFIRE ignition system makes sure that your grill lights every time by shooting a jet of flame to light the burners. Sear quickly over the integrated infrared bottom burner. Cook all of your favourite foods on a grill that fits perfectly in to your ideal outdoor kitchen. LEX605 Built-In Propane BBQ with Infrared Bottom & Rear-Burners is rated 4.0 out of 5 by 12. Rated 2 out of 5 by Anonymous from not stified I purchased this grile on jul 17/18 and it came defective, one of the led bulbs was not properly routed , it was hanguing and the second time i used it the ceramic onfrared burner back fire on me, i returned it to homedepot and will repurchase it again to see if i get a better luck, since i built an outdoor kitchen around this particular model. Rated 5 out of 5 by Kathleen from My husband is very happy with this grill’s performance.... My husband is very happy with this grill’s performance. Rated 4 out of 5 by Coldfinger from Quite nice High quality and quite functional. Side burner doesn't always light - have to resort to flame gun. And this is a small thing but I did buy a protective cover which has held up well (lots of rain in NW Oregon) but recently the webbing holding the hanging D rings quite literally disintegrated. UV rays? Not all rain here - quite a lot of summer sun. Rated 4 out of 5 by Dutchaussie from Easy start, even temp, lots of room Put this into a backyard redo. Heats evenly and fast, lots of room for burgers, chicken etc. I gave it 4 stars because it won't get below 300 degrees on "Low" without keeping the grill top open.